(01)-032 Dante Stallworth. Contains all base cards from team listed as well as Rookie Short Prints (sp's). 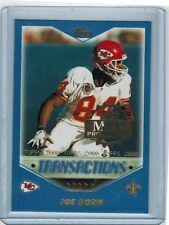 Cards average NrMint condition - Included players listed below (06)-223 Joe Horn. (07)-316 Joe Horn LL. 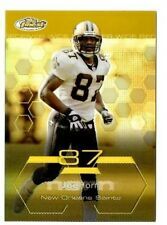 2003 TOPPS FINEST GOLD REFRACTOR JOE HORN NEW ORLEANS SAINTS #02/50! PICK UP OPTION. © 2Bros Sports Collectibles, LLC. See more. PICK UP OPTION. © 2Bros Sports Collectibles, LLC. Player: Joe Horn. Set: 2005 Bowman First Edition. Item#: 101. Year: 2005. Sport: Football. Team: New Orleans Saints. See photos. Ships within 24 hours of payment. Player: Joe Horn. Set: 2006 Bowman White. If a card has a serial numbering you may not be getting that exact numbering unless listed in the title. Year: 2006. Sport: Football. You may have to wait to get a combined invoice if it did not combine automatically. This great card features the Saints legend, and includes a certified autograph. The card is in NM condition (colorful, crease free surface), and is card Ktr-jh. Player: Joe Horn. Year: 2006. Sport: Football. Attributes: Serial Numbered. Team: New Orleans Saints.